extraordinary stability, really shows off the full capabilities of the EOS 40D / EOS 50D. Designed for easy operation so you can comfortably reach the main dial and quick control dial with your fingers, while keeping your hands on the grips. Delicate operations are possible even while you are looking through the viewfinder. The larger diameter of frequently-used dials allows you to change the shutter speed or aperture value with a light touch while supporting the framing. This frees you, the photographer, to concentrate only on the perfect chance for a great picture. The included 6-pin wired connector accepts the optional YS Converter/C. The converter works with the YS-Series strobes to provide automatic TTL flash adjustment. *The converter requires the Sync Cord/N for connecting to a strobe. 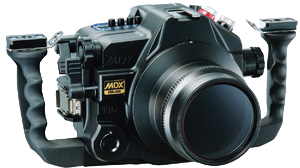 *The MDX-40D housing comes from the factory with these bulkhead connectors: one type-N (2-pin wired) connector and one 6-pin (6-pin wired) connector. *To use two SEA&SEA YS-Series strobes with the factory-equipped bulkhead connectors, you must use the 5-pin Dual Sync Cord/N. Comes standard with two bulkhead connectors: one type-N connector (2-pin wired for manual) and one 6-pin wired connector (for dedicated TTL). Compatible with the Shutter-Activated Focus Light46060 (optional, factory modification is required). *1 Live View function is not operable from the housing.